23/06/2015 -- Dibaga-Makhmur-, Iraq -- Muhammad Jasim 52 Y.O. and Mona Ibrahim Hussein 70 y.o. from Jarallah village sit in their new home at the chicken farm in Dibaga. 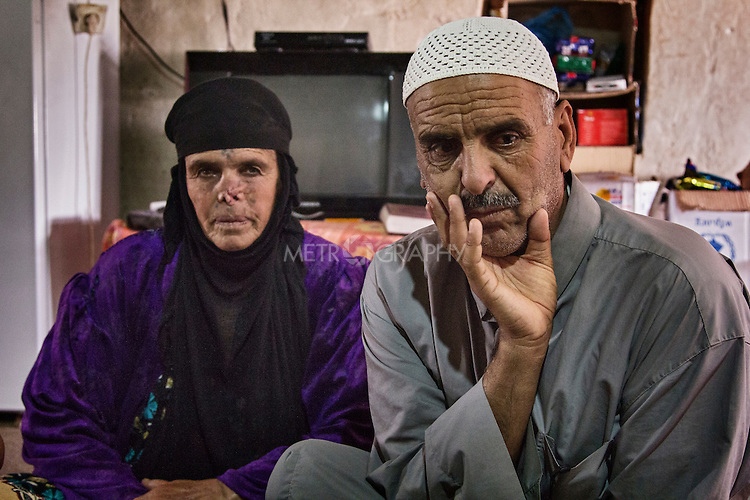 Mona Ibrahim Hussein, who lost her nose from an infection and the surgery to repair it was unsuccessful, has seen two of her sons taken by the Kurdish Security forces into custody on suspicion of being affiliated to ISIS.